The Flashmeeting project research gives insights into how live videoconferencing can be used in novel ways, supporting online communities and creating new reusable learning objects. 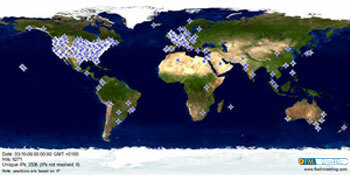 FM has been used over four years by a great variety of communities of learners and knowledge workers across the globe. Apart from our contribution in preventing travelling for face-to-face meetings by providing alternative ways of virtual communication, our research investigates how FM is used to foster online communities, how to search and browse FM replays and use them as objects to learn and a number of other themes. How can we make virtual connections really work? In the Knowledge Media Institute, we are not just mimicking physical meetings, but we aim at finding new perspectives to improve the virtual communication. The FM push-to-talk technology and parallel communication channels have been used successfully over four years of experimental research. Our eWell-Being research focuses on how to conduct more effective meetings, saving the environment from carbon dioxide emissions, saving time and travel expenses. How can live video events help change children's classroom experiences? FM is already being used by schools across the UK and beyond. We have schools registered in Europe and the USA. The eTwinning project includes a series of events between the UK and Finland, Germany and other EU countries. Recently E2BN had its first FM with China. FM is ideal for pupils practicing their language or communications skills and for joint project work in many curriculum areas bringing new opportunities for learning into the classroom. Can videoconferencing support open learning communities? FM has been integrated with the OpenLearn environments LearningSpace and LabSpace (Tomadaki and Scott, 2007; Tomadaki, Quick and Scott, 2008). Anyone in the world can get an account with the OpenLearn websites and use FM with their fellow open learners. The tool has been especially useful to foster open sensemaking communities (Okada, Tomadaki, Buckingham Shum and Scott, 2007; Okada, Tomadaki, Buckingham Shum and Scott, 2008). Is it possible to visualise the roles of meeting participants? The FM servers generate automatically linear representations of the meeting or polar area diagrams indicating the participant dominance in the use of chat or broadcast (Scott, Tomadaki and Quick, 2007). These representations may on the one hand indicate the type of event held (seminar, interview, web-cast, moderated or peer-to-peer meeting), and on the other portray the different user roles (leaders and lurkers). Can we measure the quality of a meeting and its components? At the coarse-grained level it is already possible to see different meeting types by their characteristic polar area diagram 'footprints'. Nonetheless, we are still unable to fully explain what actually 'went on' in the meeting. To complement our linear and polar visualisations and find out what really happens in a meeting, we have moved to a fine-grained analysis of speech acts, accompanied by lexical analysis and emotion identification (Binti Abdullah, 2008; Binti Abdullah, Tomadaki, Scott and Honiden, 2008). How can we measure the FM Live and Memo impact? To analyse the global impact of FM, we indicate individual attendance by using attention metadata indicating user browser hits and plot the geo-location of unique IPs on maps, showing in this way the participation in live events and the event replay reuse (Tomadaki, Scott and Quick, 2007). FM replays can be used and reused as informal learning objects in formal and non-formal contexts (Castañeda, Tomadaki and Scott, 2008). How can we search and retrieve meeting replays? An interface to search and retrieve public meetings via keywords has been implemented in the Ariadne project. The meeting title, keywords and description added by the event owner are saved in an XML file, which can be processed for replay retrieval. At the moment, only exact matches are realised. Can we use the data about what a user looks at to have more effective virtual meetings? Contextualised attention metadata (CAM) may give insights into which tasks users focus on during an online meeting. CAM indicates the users' context, preferences and browsing path. Following the CAM approach in FM may improve multi-tasking in virtual meetings and serve as a foundation for recommender systems matching users' behaviour (Memmel, Shirru, Wolpers and Tomadaki, 2008). How can we enhance browsing, retrieving, recommending and sharing FM replays among peers? Enhancing a traditional digital repository with social media functionalities allows for a richer description of the resources. The combination of machine-generated metadata with user-generated metadata can improve searching, rating and recommendation applications. Syndicated FM replays have been linked with the ALOE social media platform so that users from anywhere in the world can tag and rate them (Memmel, Wolpers and Tomadaki, 2008). How can we better make sense of what happens in a meeting? Knowledge mapping can be used to collaboratively brainstorm during a live virtual meeting or to reflect upon the knowledge transferred during the meeting by browsing its replay. Both the live FM and the Memo have been integrated with tools for knowledge mapping, which allow for the creation of maps including nodes representing all FM interactions linked to specific video segments (Okada, Tomadaki, Buckingham Shum and Scott, 2007; Okada, Tomadaki, Buckingham Shum and Scott, 2008; Naeve, Palmér, Nilsson, Paulsson, Quick and Scott, 2006). What are the good practices in using videoconferencing for professional learning? 'Proteach Italia' is the collaborative research project, launched in 2007 by the Knowledge Media Institute and the University of Padova. The project aims to explore the use of video conferencing innovations to enhance the learning experience of professional groups. Specifically, the project will evaluate the use of FM in the teaching of Italian language teaching professionals as they learn techniques for teaching English to students. Armakolas, S., Alimisis, D. and Panagiotakopoulos, C. (2013): The Flashmeeting digital videoconferencing system: Τhe case of the "I am not Scared" project. In proceedings of the 7th International Conference in Open and Distance Learning (ICODL 2013), November 8-10, 2013, Athens, Greece. Örnberg Berglund, T. (2009). "Multimodal student interaction online: an ecological perspective", accepted for publication in ReCALL Journal. Scott, P.J, Tomadaki, E. and Quick, K.A. (2007). "The Shape of Live Online Meetings". International Journal of Technology, Knowledge and Society, Vol 3. Scott, P. J., Tomadaki, E., Quick, K. & Linney, J. (2007) "Live Online Meetings in Different Communities of Practice", Proceeding of the 3rd International Conference on Technology, Knowledge and Society, Cambridge. History - Take a look at how The Flashmeeting Project has evolved over time.